Average benefits surge to HK$154,000 in 2016 from HK$68,000 in 2006. The average accrued benefits held by Hong Kong’s Mandatory Provident Fund (MPF) plan members have more than doubled over the past 10 years, from an average of HK$68,000 ($8,700) in 2006 to HK$154,000 in 2016, the fund reported. The MPF system is an individual savings account arrangement, under which contributions paid by or on behalf of members are used to purchase units of MPF funds, which are accumulated in the member’s account, as are any returns generated by the MPF funds. 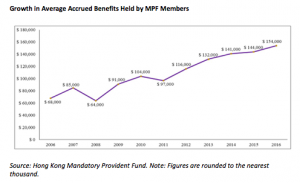 Over the past 10 years, the MPF has reported rapid growth in the amount of voluntary contributions made to MPF plans. From 2007 to 2016, the total amount of voluntary contributions nearly tripled, to HK$9.49 billion from HK$3.56 billion. As a percentage of total contributions, voluntary contributions rose to 14% from 11% during this period. The report also found that there was a gender gap among members’ benefits, which widens with age. The average accrued benefits of male members were HK$169,000, 22% higher than those of female members, who had average accrued benefits of HK$139,000. And male members aged 60 to 64 had an average of 65% more accrued benefits than female members in the same age range. However, the accrued benefits of female members aged 25-29 were slightly higher than those of male members in the same age group. Approximately 38% of accounts had accrued benefits below HK $10,000, while 29% accrued benefits between HK $10,001 and $ HK 50,000, and 23% accrued benefits of HK $50,001 to HK $200,000. Nearly 10%, or approximately 870,000 accounts, had accrued benefits of more than HK$200,000, and nearly 2%, about 140,000 accounts, had accrued benefits of more than HK$500,000.